FIRE & POLICE GRADUATIONS: The Honolulu Fire Department's 91st graduation was held for 23 recruits yesterday at McCoy Pavilion. 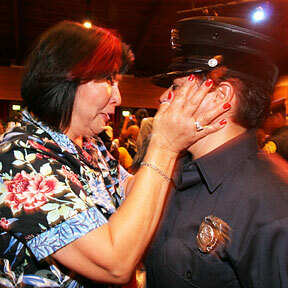 New firefighter Erica Fernandez shared an emotional moment with mother Queta Fernandez, who pinned on her badge. The 156th Honolulu Police Department recruit class also graduated 25 members yesterday in the Blaisdell Concert Hall.